I have referred to my ancestors in the past as “new immigrants”. I have no pilgrim or colonial roots. My ancestors didn’t start arriving on the scene until the mid to late1840s. My first American born ancestor was my great great grandmother, Margaret (Kelly) Dolan. I know very little about the early story of Martin Kelly and Catherine Dolan. Records say they were both from County Roscommon. I don’t know if they were married in Ireland or America. What I do know is that by 1849 they left their homeland for a better life. They lived in Manchester, Hillsborough Co., New Hampshire. 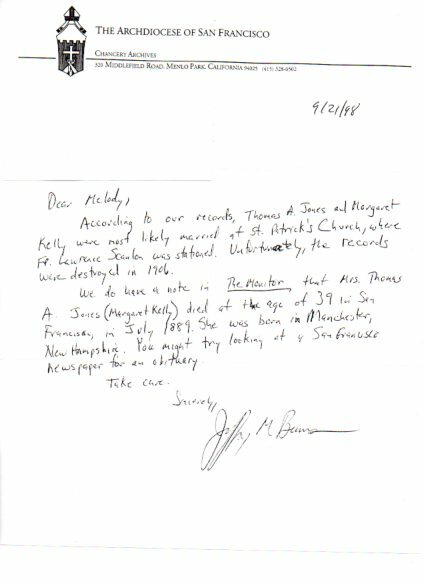 According to this letter from the Archdiocese of San Francisco, it was there they they had a daughter, Margaret, my ancestor. While I didn’t have the obituary from the Catholic newspaper, The Monitor, I was able to use this information to find her obituary in the San Francisco Call. According to that, Margaret was born in November of 1849. That makes Margaret my first American born ancestor. Margaret had somewhat of an unsettled early childhood. Her parents didn’t stay in New Hampshire very long. They were in Roxbury, Boston, Massachusetts the 19th of April 1851 when Margaret’s sister, Catherine, was born. A brother, Michael, was born 13 of March 1853. And, then, the family was off again, for greener pastures…or boardinghouses, in San Francisco, California. Sometime between Michael’s birth and John’s in 1856, Martin and Catherine uprooted their family a final time. They settled in San Francisco where Martin Kelly became a businessman. What was life like in San Francisco for the Kelly’s? The Images of America Series has this great book “Irish in San Francisco” with numerous photographs depicting their experience. In looking through this books, I’ve got a little bit better idea of how they might had lived. Even though Martin could not read or write, by 1860 he was a horse trader and boardinghouse owner. From there he bought different plots of land around San Francisco and San Mateo Counties. He had at least two boardinghouses at any given time. He owned the 7 Mile House which is referred to in tax records as a hotel and the 6 Mile House on Mission Road, a boardinghouse and saloon. Margaret was about 6 years old when they moved. I don’t know what her childhood was like. The Kelly’s lived in one of their boardinghouses and her mother was the housekeeper. I suspect Margaret worked alongside her mother or helped out with the younger children. Nine children were born by 1872, two of them not surviving beyond a year. Around 1867, a man from Australian moved onto the same street as the Kelly’s. His name was Thomas Augustine Jones. It is certain that their paths must have crossed at one point or another. Though it is not clear how. Thomas was 10 years older than Margaret. 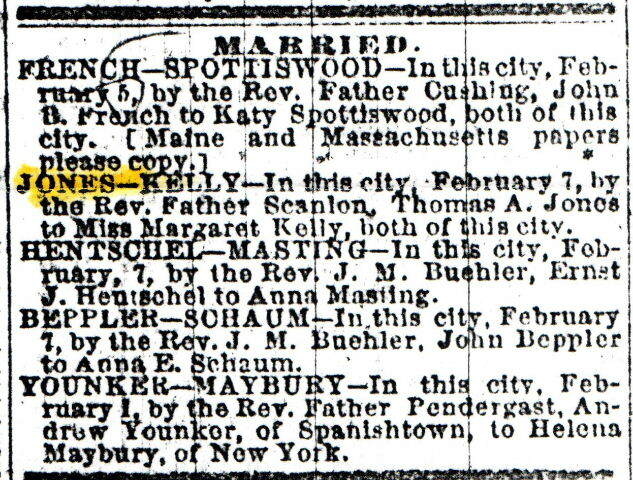 Thomas was a Blacksmith and 29 years old when he and Margaret tied the knot on 7 Feb 1869. They were married at St. Patrick’s church in San Francisco. The lived next door to the Kelly’s. Margaret gave birth to one child after another from 1870 to 1889, eight in all. My great grandmother, Margaret Mary (Jones) Jackson, was their 5th child born in 1880. Her mother-in-law, Mary Jane (Haywards) Jones, lived with them. Margaret became pregnant in November of 1888 with their last child. She gave birth to Francis Jones in early July of 1889. Margaret and Francis would not survive this birth. Margaret died from complications of childbirth on the 13 Jul 1889. Francis survived 3 more days, dying on the 16th. Although I don’t know much about Margaret, I wonder what it was like for her being the first child born in the family in a strange country. Did she feel as if she lived in to cultures? Was the Irish community so close knit that it was her world? I will never know these answers. I do know that she was the first American native in my tree. A tree filled with many more immigrants to come. Who was your first ancestor born in America? Tell us about it in the comments.